A late 17thc joined standing oak livery cupboard with fruitwood mouldings. At the top of this piece is a dental moulding with an applied fruitwood circular decoration. 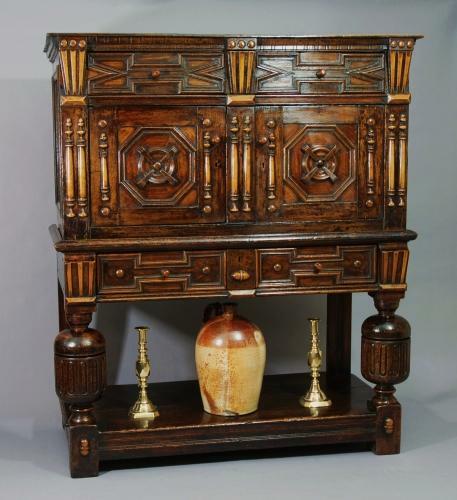 There is a large drawer at the top with applied oak geometic mouldings with fruitwood knobs. In the centre of the drawer, a decorative fruitwood applied moulding. There are two doors to the cupboard, both with turned fruitwood mouldings. At the centre there is a circular turned decoration surrounded by walnut with a geometric moulding. There are various other turned applied fruitwood mouldings decorating this piece. On each of the sides of the cupboard is a recessed oak panel surrounded by an oak moulding similar to that on the drawers & door panels. Underneath is another large drawer with oak applied moulded geometric mouldings & fruitwood knobs. This leads down to four legs, the back being straight & the front two being bulbous & carved. At the bottom there is a shelf which would have been used for the storage of pots etc. The back of the piece consists of four oak boards which are fixed with handmade nails. The description 'livery' was a word added to various items such as a livery cupboard. A livery cupboard was used in a household to store wine & bread and other perishable items. Some have one door or like this one, two doors.